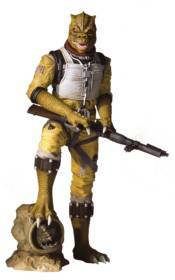 The bounty hunter known as Bossk has been a fan-favorite since his debut in 1980. His popularity could not be contained to his brief appearance on the deck of the Executor in The Empire Strikes Back (and in the background of Jabba's sail barge in Return of the Jedi). Bossk soon started filling out his robust backstory in both the Star Wars: Clone Wars and Star Wars: Rebels animated series, taking on the role of mentor to the young, orphaned Boba Fett. The artists at Gentle Giant take you on a journey to see the moments just following the events of the death of Jabba, we find Bossk standing over the shattered throne of Jabba. At his feet, a chain left by Jabba's escaped prize. What will he do next? Bossk is the third statue in Gentle Giant's new 1:8th Collector's Gallery line, celebrating 40 years of the Star Wars universe. Each limited edition, hand-painted piece is cast in high-quality polyresin with crisp details. This statue also comes individually numbered with a matching Certificate of Authenticity.